KLM is showing some pretty insane prices on flights from Toronto to India right now. Dubai and Tel Aviv have also dropped considerably. UPDATE: Nov 18 @ 11:06 AM EST - Prices appear to be back to normal this morning. 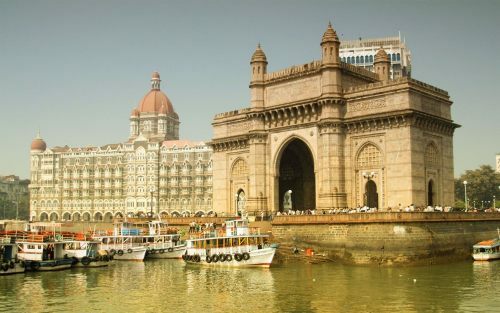 Where to stay in Mumbai, Bangalore, Chennai, Tel Aviv, Delhi, Dubai, or Hyderabad ? The following AirBNB links will lead you to some great deals on places to stay in Mumbai, Bangalore, Chennai, Tel Aviv, Delhi, Dubai, or Hyderabad for under $39-$139 CAD/night for 2 people. toronto, yyz, flight deals, asia, klm, air france, dubai, united arab emirates, dxb, persian gulf, delhi, india, del, south asia, tel aviv, israel, tlv, mumbai, bombay, bom, bangalore, blr, chennai, maa, hyderabad, hyd, abu dhabi, auh and the middle east. 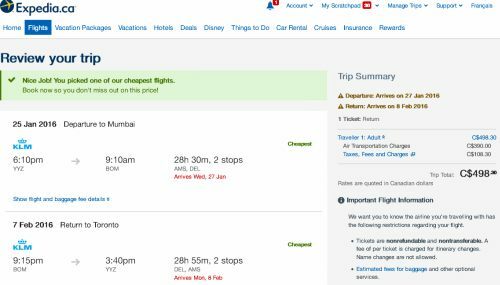 10 Responses to "Toronto to India - $498 CAD roundtrip including taxes"
have tried numerous of the dates in Jan and mar and apr to delhi, nothing seems to be showing up...is sale over? Still a lot of working dates out there. Have been updating the blog post with any new date combinations that yield a cheap price. They are all gone, they were all showing as of last night at 10pm. Checked them all this am to all India - so this deal's over. I was able to book a flight to India last night for me and my family that we otherwise could not have afforded to do. A real blessing for us to be able to see family there (and the first time for my daughter to be able to meet aunts and uncles) ! About $1,500 for three tickets via Expedia for TD then used points I had been collecting for many years to get my cost below $500. Crazy price! Thanks so much for posting this deal. Excellent! Have a great time over there with the family Kris! I went to book this deal today. Sad to see the price went up.